and by the way...I think Cetaphil is PERFECT for acne prone skin, especially when using in conjunction with a spot treatment or some other kind of treatment. That's what I do and I really think my skin is getting better! I've heard so many good things about Moroccan oil. I'm glad to hear it is working for you. Maybe I need to give it a try! I haven't tried either of these, but your post makes me think that I should. I have been hearing about the wonders of Moroccan oil for a while, but the price tag has made me hesitate. Perhaps I should just splurge, would be worth it if it's going to help my dry & blah hair! I'm feeling exactly like you. I was telling my mum earlier that I felt like cutting my hair short, and I know I'd regret it if I did, so I'm not going to. I use to have really frizzy, bushy hair and I had loads of it. I looked like I had a birds nest on my head,lol. I had such enough that I went and asked a hairdresser what to use and they gave me the ole relax serum, and I haven't looked back (I do have the colour one though for times when ole relax is too heavy for me). I like Kerastage Oil Serum, although I have straight hair I use it every summer when I am on vacations and my hair turn crazy and dry! 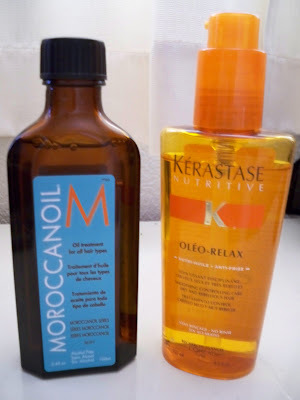 I am in love with all the Moraccan Oil products!! The shampoo and conditioner are just as great as the oil!